Brent Security is dedicated to providing unique and unrivaled firearm training for both the private individual, security job seeker and security officer. We are professionals in the context of firearms use. We offer a variety of firearm training courses for individuals and security officers. These courses range for an individual who just purchased a firearm, to law enforcement, and everything in between. 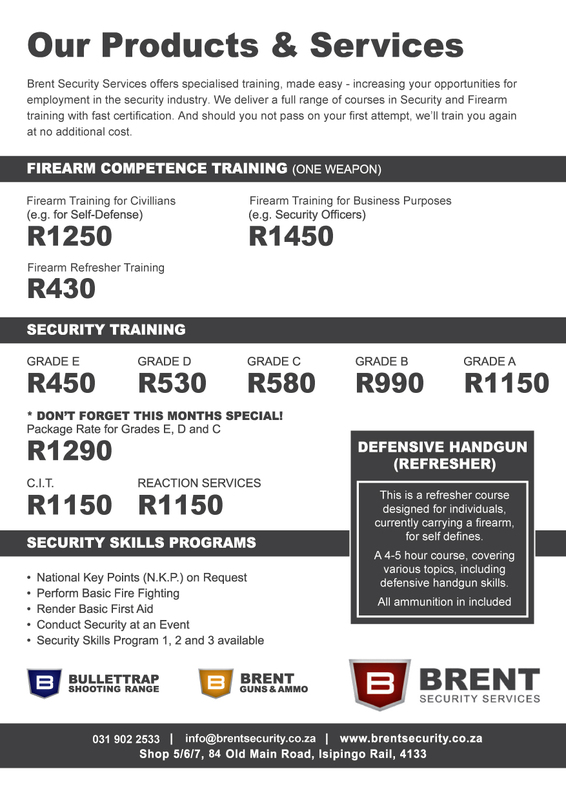 Our firearm training facility is centrally located in Durban, and is easily accessible by all forms of public transport. Our instructors are fluent in iZulu and English, and provide a friendly, fun and memorable training experience. Brent Security has been in operation since 2001 and we are fully accredited with SASSETA, SAPS, PSIRA and SABS. We guarantee results with our firearm training and should you not pass your certification on your first attempt, we will retrain you at no additional cost. According to the Firearms Control Act 2000 (Act No 60 of 2000) all who possess or wish to obtain a firearm, have to complete as a minimum criterion, the unit standard Handle and use a (handgun/shotgun/rifle). You can complete this by either attending a full course or by means of recognition of prior learning (RPL). This is the program you need as a beginner in the defensive use of the handgun, or the experienced shooter in search for an appropriate refresher. An orientation on the range, is followed by spending the rest of the day or two working on defensive shooting skills. This is typically a course you should do before attempting level II programs. A rifle was designed for accuracy and many shooters cannot achieve the level of accuracy it inherently possesses. Musketry skills were developed from rifles and the application of these skills will transform any shooter into a Sharpshooter. The successful hunt of a prize trophy in the bush, or the elimination of a threat at long range is the issue can be resolved. The pump-action shotgun in 12 gauge is probably the most common shotgun around. This course will teach you correct handling, loading and rapid firing of the shotgun over various distances to make you proficient with shotgun in a defensive role. The course will also prepare the active shooter and security officer, on how to handle this firearm optimally. This will be the minimum requirement for armed Security Officers . Here you require a level I course to continue with any course on this level. Here the focus lies on mastery of the type of firearm with much trigger time spent on the range. Making sure you are very familiar with you firearm and equipment.